Two rooms stood out for good sound without an astronomical price tag. The first was the Nola Contender loudspeaker ($3400) driven by a PrimaLuna PA-1 integrated amplifier ($2995) as presented by Upscale Audio. 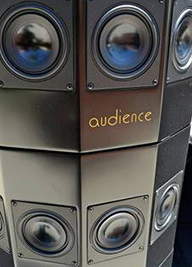 The second system included The ONE loudspeaker from Audience, a tiny cube housing a single full-range driver. Everyone in the demo thought that the subwoofers in the corners were active, but the full bass was coming from the $995-per-pair ONEs. At the end of the demo, a showgoer began applauding. “I got to hear both the Audience ClairAudient 2+2 loudspeaker ($5000/pair, reviewed in the July 2011 issue of Stereophile) and the diminutive ClairAudient THE ONE ($995/pair). Associated electronics and cables were also from Audience and included the Wavepower monoblocks ($14,000/pair), a class-D analog switching power amplifier that put out 200W into 8 ohms, the Wavemaster preamplifier ($13,000), and AU24e cables and power cords and an Adept Response High Resolution Power Conditioner ($5000). The source was an Audience-modified Oppo BDP-83SE Blu-ray player, which was not for sale (priceless).